Immediately following his first American museum show at the Chelsea Art Museum, the Wessel + O’Connor Fine Art gallery is proud to announce an exhibition of large black-and-white photographs by Wouter Deruytter. 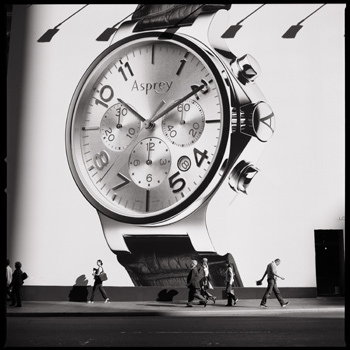 For more than four years Deruytter has repetitively photographed the omnipresent billboards strewn throughout the streets of New York City. A native of Belgium, Deruytter adopted New York as his home more than a decade ago. Creatively inspired by this complex city and its overabundance of commercial advertising, he began to record the visual substance of these gigantic pictures as well as New Yorkers’ curious reactions to the images. These billboards, in many ways, capture the peculiar forces found in the existence of many New Yorkers, a kind of balanced blend of high art and vibrant commerce. The billboards are massive, often provocative, and seemingly impossible for New Yorkers to ignore. Yet they often do. Deruytter captures the interactions of people going about their quotidian affairs, who sometimes are overwhelmed by these colossal images, but often find them just as easy to ignore completely. Deruytter’s New York is one that exists only through the probing lens of his camera, which captures real people and their surreal counterparts, all in one affectionate gaze. Deruytter began his art studies at the Ghent Royal Academy. He later went on to study at the International Center of Photography in New York. Deruytter has exhibited extensively throughout Europe, Mexico, and the United States.